How can I make a code generator, changing so that everyone has a single code? and can I make a QR code that way also ? I'm not sure if I understand your query correctly. Are you referring to the Captcha field on your JotForm? If you want to generate unique IDs for each submission, you may consider adding Unique ID widget to your JotForm. Please refer to the guide below that can help you with setting up Unique ID widget on your form. 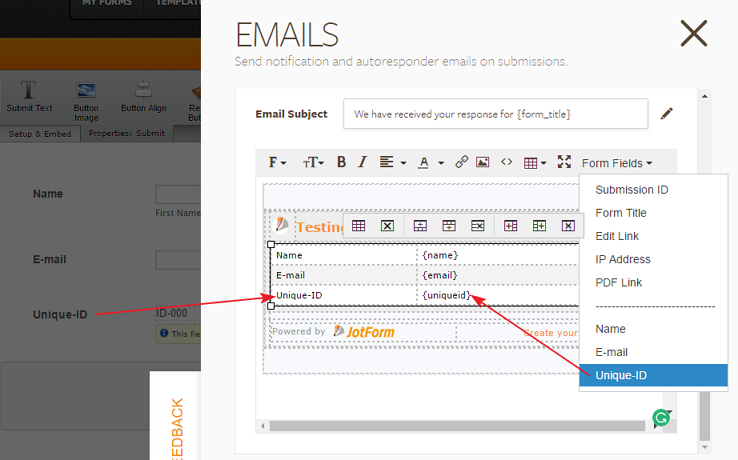 If you want to generate QR code on your JotForm, you may consider using Dynamic QR Code widget. Please take a look and let us know if you need any further assistance. We will be happy to assist. Thanks for replying, That is exactly what I meant. have another query about QR code , How can I include it in the "Thank You" page? and How to email it with the Unique ID to each recipient? The other question related to QR Code is moved to a separate thread and shall be addressed there shortly.